The Laser Methane Mini (SA3C32A) and Laser Methane Mini-G (SA3C50A) are laser-type detectors capable of safely and quickly detecting methane gas leaks from a distance. The Laser Methane Mini-G guarantees best visibility through green laser and capable to communicate with mobile devices! By linking to an Android device, you can view your recordings as a graph, the measurement history and measured locations on a map. The measurement principle of this equipment uses the characteristics of methane, which absorbs the laser beam (infrared rays) of a specific wavelength (infrared absorption technology). The laser beam directed at targets such as gas piping, the ground, etc., will reflect back a diffused beam from the target. The device will receive the reflected beam and will measure the absorptivity of the beam, which will then be calculated into methane column density (ppm-m). Easily spot sight of a measuring point even under strong outdoor sunlight with the green laser pointer’s excellent visibility. With the inclusion of an organic electroluminescence display, measurement values are clearly displayed for clear methane detection readings. In addition, when detecting methane gas, Laser Methane mini-G indicates this with a flashing super- luminosity LED and buzzer. 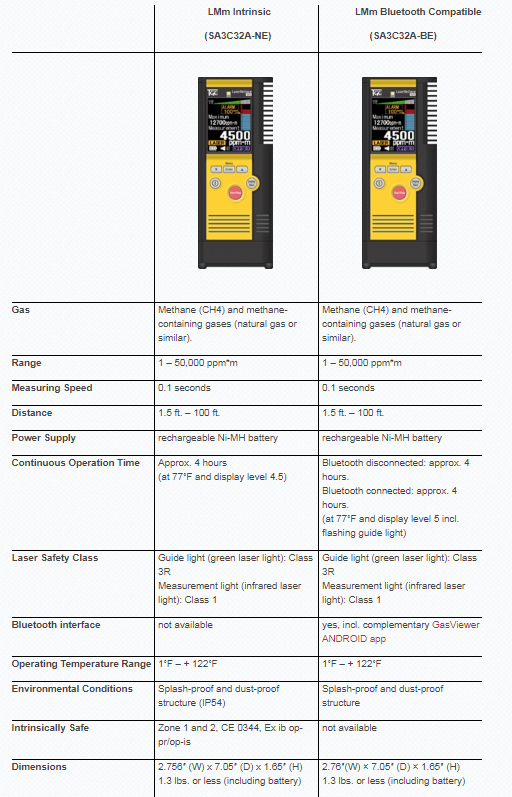 Wireless communication is enabled when an exclusive application is installed on an Android device, which can then record the values measured by Laser Methane mini-G. Also, in conjunction with the GPS function on the Android device, you can view the measurement history and the measured locations on the map.